For after hour emergencies please click here. Dr. Julie Stanek has wanted to be a veterinarian as long as she can remember. Born in Northern Illinois she moved to Texas as quickly as possible and is still thawing out. She graduated from Texas A&M Veterinary School of Medicine in May 1994. 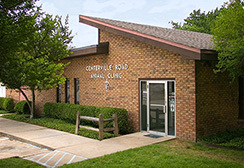 She bought Centerville Road Animal Clinic in 2003.